Jana Lee began her career in Oncology in 2010 when she had an opportunity to take a temporary position at the Juravinski Cancer Centre in Hamilton. One to jump at new opportunities, little did she know that this would spark a new passion in her career. Learning about de Souza Institute’s course offerings she began her education in Oncology. 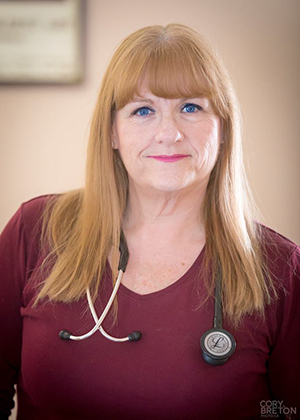 She completed her de Souza Nurse Associate designation in 2014. Jana Lee Breton recently transitioned to the Juravinski Cancer Centre, Hamilton, in the Chemotherapy Suite. Her experience working in the Hematology/Stem Cell Transplant Unit provided a foundation of essential oncology experience, but she wanted to learn more about care and treatment of solid tumors. Jana Lee continued to study and completed a de Souza fellowship as well as her CON(c). She achieved her goal of de Souza Nurse Designation in the spring of 2016. She enjoys acting as a facilitator for the Administration of Chemotherapy and Biotherapy Course at the de Souza Institute. Jana Lee looks forward to continuing her education with de Souza and would like to participate in more teaching opportunities with the Institute in the future. She has amassed 35 years of experience spanning across education, research, administration and patient care. She exemplifies a passion for her practice in every aspect and is a wonderful example to her colleagues who aim to follow similar paths in their professional development.